Download "NON-PRECEDENTIAL DECISION - SEE SUPERIOR COURT I.O.P. 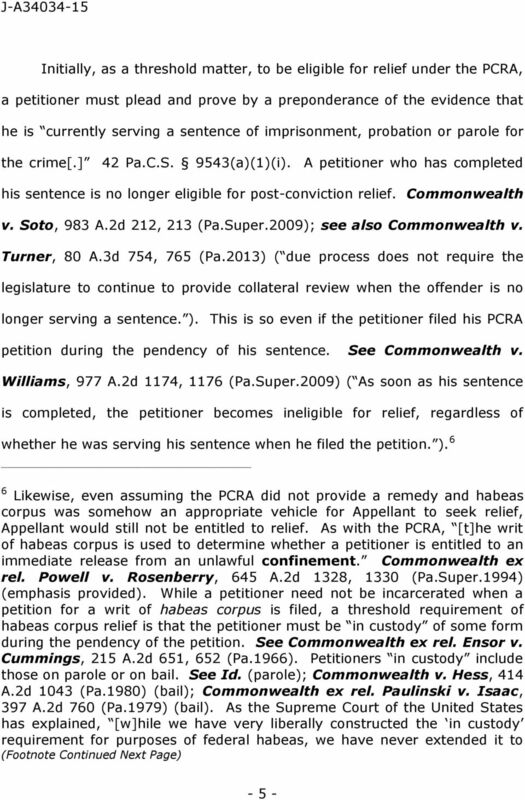 65.37"
1 NON-PRECEDENTIAL DECISION - SEE SUPERIOR COURT I.O.P ANTONIO L. HORNE, SR. Appellant IN THE SUPERIOR COURT OF PENNSYLVANIA v. DAUPHIN COUNTY PRISON AND DOMINIC DEROSE Appellee No. 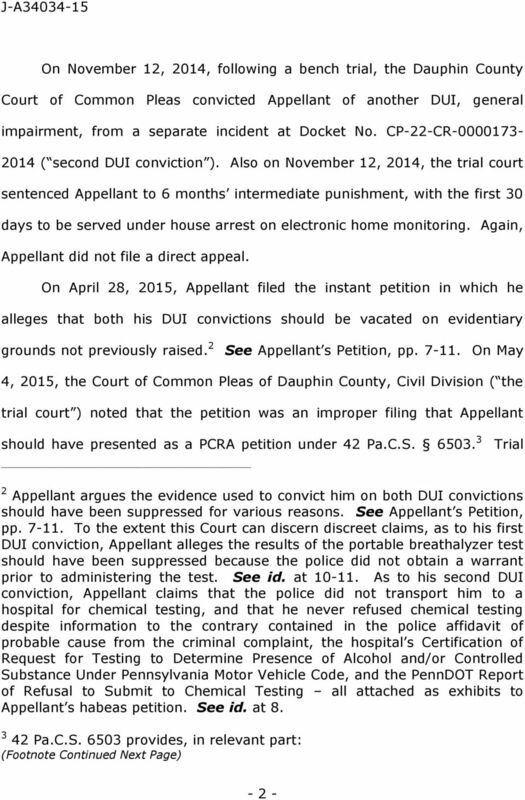 911 MDA 2015 Appeal from the Order Entered May 4, 2015 In the Court of Common Pleas of Dauphin County Civil Division at No(s): 2015-CV-03336MP BEFORE: PANELLA, J., OTT, J., and JENKINS, J. 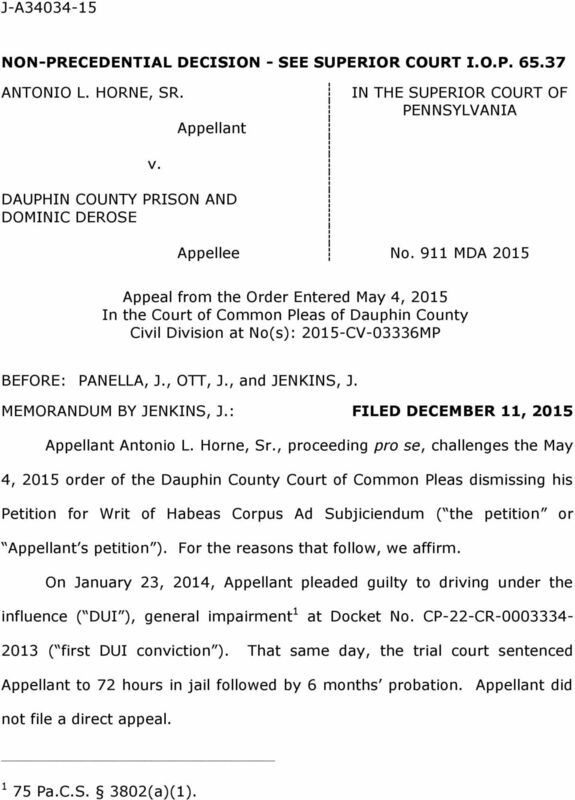 MEMORANDUM BY JENKINS, J.: FILED DECEMBER 11, 2015 Appellant Antonio L. Horne, Sr., proceeding pro se, challenges the May 4, 2015 order of the Dauphin County Court of Common Pleas dismissing his Petition for Writ of Habeas Corpus Ad Subjiciendum ( the petition or Appellant s petition ). For the reasons that follow, we affirm. On January 23, 2014, Appellant pleaded guilty to driving under the influence ( DUI ), general impairment 1 at Docket No. CP-22-CR ( first DUI conviction ). That same day, the trial court sentenced Appellant to 72 hours in jail followed by 6 months probation. 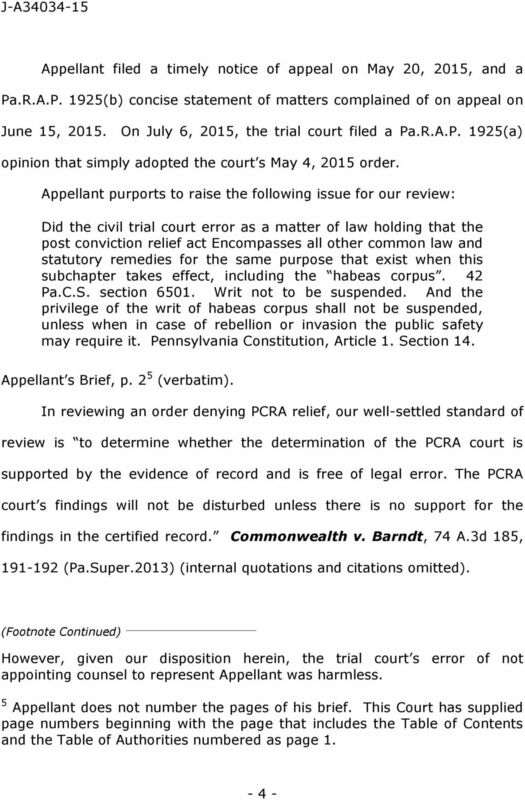 Appellant did not file a direct appeal Pa.C.S. 3802(a)(1). 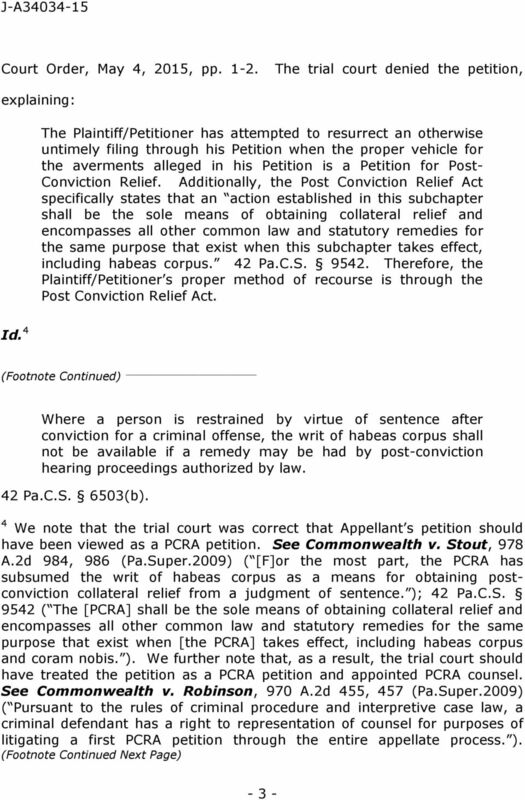 J. S54036/15 NON-PRECEDENTIAL DECISION - SEE SUPERIOR COURT I.O.P. 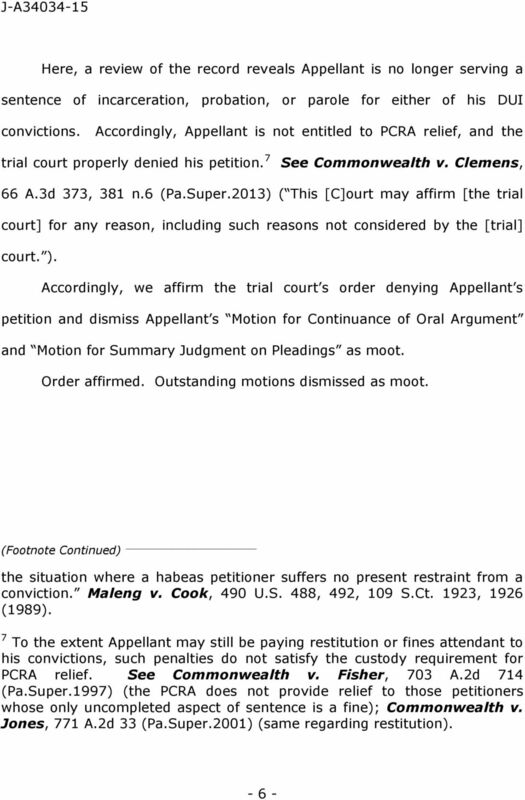 65.37 COMMONWEALTH OF PENNSYLVANIA, : IN THE SUPERIOR COURT OF : PENNSYLVANIA Appellee : : v. : : HOLLY SHAUGHNESSY, : : Appellant : No.